This is a post that’s been brewing for a while, and is a follow up to my post 5 Rules For Playing Yarn Chicken which I wrote a few months ago. Running out of yarn does not always have to mean a project needs binning, frogging or resigning to the Unfinished Object heap-there are plenty of ways to deal with it! I’m going to start with solutions for when you ‘know’ you’re going to run short well in advance, for example if you know that you’re a few yards short but you’re using some very swish hand dyed yarn that you can’t get more of. If it’s variegated yarn you could pick out one of the colours and use another yarn that matches (or contrast well!) to work the ribbing on garments (and heels/toes on socks) or the border etc for blankets. It might be that there is a place you can make a contrasting stripe before continuing in the original yarn-this looks especially effective on blankets. A series of stripes worked in as part of the design can also make it look as if you had planned it all along and definitely weren’t running out of yarn. If you get the end of a project and are literally a few inches of yarn short, there are a couple of things you can do to reach the end of that last row or round. Frog the last row/round or two and rework them, perhaps with a slightly tighter tension. This works really well with acrylic yarn as it stretches, so you’ll probably find that you all of a sudden have enough yarn without it affecting the appearance of your project. I haven’t tried it when using other fibres, so feel free to leave a comment below if you have tried it and share whether it worked for you or not. 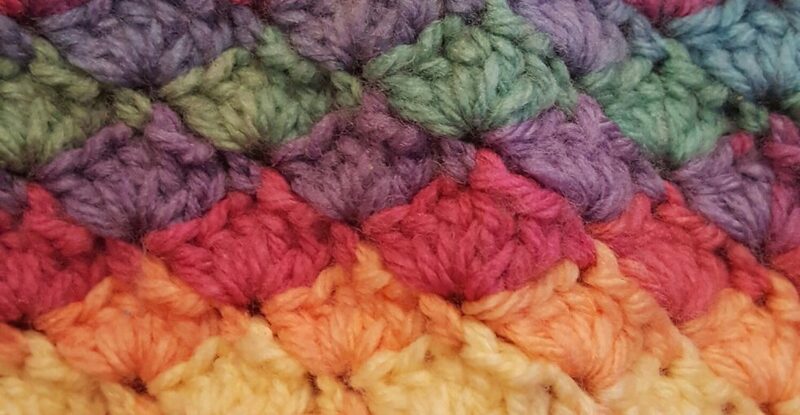 Another thing worth considering if you are making a blanket in rounds is whether you can just use up what you have of the main colour and make a wider border using a contrast colour, so that you still get the size you want. It’s amazing what combinations of colours you can come up with when you raid your stash. It can be done really subtly-unless of course you are trying to recreate the ’80s, in which case anything goes! If all else fails, you could just swear, stamp your feet and throw it in a dark corner until you’re ready to try and deal with it (or frog it). How do you make sure you win at yarn chicken? Do you have any more tips to add? Thanks, I’m hoping it might be helpful. I think these are the two approaches I would try, if i felt that the piece would not benefit from/be rescued by some little border stuck all around it or just at top and bottom etc. You are talking Greek to me but I’m sure it works because you do such beautiful work. Lol, I’m hoping someone might find it handy. But in the end, you had enough yarn. I’m so sorry to stamp all over your win, but you know deep inside it’s a bitchy thing to say and it’s so true. Just dish on me without mercy. You just won. Because you had more yarn. It’s so upper middle class. So horribly almost bourgeois but not quite there because you went to university. It’s that win you won without winning much. Your comment has confused me, because this post was meant to be helpful for anyone finding themselves running short but still wanting to complete their work and not a ‘showing off’ at all. Please could you explain? It’s sarcasm but I see why it’s confusing. In other words: you won at yarn chicken! I’ve lost so many times. Does it make sense now? It’s true, though, you’ve taught some people to win at yarn chicken. Or have you? (this is when the sinister horror movie music plays, LOL) In all, though, yarn chicken is a blogging topic that is so amusing, yet so dark. Lol, yes, I get you. I maybe shouldn’t read and reply to blog comments before I have my first cup of tea in the morning! Thank you, I’m sure we stress more about these things than the recipients of our makes! I’ve used some decidedly dodgy colours when I’ve run out before. I thought I was adventuresome with gas roulette 😅 nice post thank you. Where people might sigh, say a few choice swear words and then give up… you’ve done something that should have occurred to them before, but for some reason didn’t! You’ve given them permission to do something that is so easy, that it actually didn’t even come to their mind! AND … added to that … they would be doing something so very fashionable at the same time, by adding another colour to one end of their project. Let’s take a scarf (because I’m qualified to make scarfs as they don’t go round corners) … if they wanted to make a scarf which was 100 inches long (yes, long I know), but realised that they were going to be out of wool at 96 inches … adding a contrasting colour – or even the chosen colour of the year – onto one end, would suddenly turn the item from ‘just a scarf’ into a designer scarf. Then … if they wanted to go the whole hog … they could use this same coloured wool, and add coloured tassels to the OTHER end of the scarf – so that the colour shows up at both ends, but for totally different reasons. Oooo… I LOVE your idea. It totally makes sense! Well done for suggesting it. You’ve given people (and me – who’s from another planet, as we all know) something to make our brains think out of the box. You granted the permission, when we didn’t even realise that there was anything to be granted permission for. Seriously Mrs.C … you’ve done so many knitters a great service here. Well done you clever thing. Excellent advice on this! Thank you! I’ll look out for them! I think socks look lovely with contrasting heels, cuffs and toes. I have so many projects in the corner from when I was just learning. Now I wish I would have just bought the extra skein! So many yarn chicken fails in the early days! Great post! !